Marinara pasta is usually smothered in a rich tomato sauce. 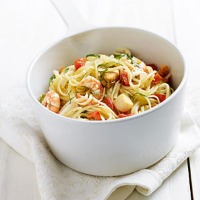 This version uses seasonal Mediterranean tomatoes to give a real summery flavour. Bring a large pan of water to the boil over a high heat. Add the linguine and cook according to pack instructions. Drain, reserving about 2 tbsps of the cooking water, keep warm. Meanwhile, in a large pan, warm the olive oil over a high heat. Add the lemon zest, garlic and capers, and cook for 30 seconds or until just starting to colour slightly. Add the fruits de mer and lemon juice and cook for a further 8-10 minutes or until the seafood is cooked through and the prawns are pink. Remove from the heat and mix in the tomatoes. Tip the drained linguine and reserved water into the sauce. Add the basil and seasoning. Toss together to combine. Serve with lemon wedges.